This post originally appeared at Jacobin. The Bernie Sanders campaign has injected socialism into the mainstream discourse for the first time in decades. Young Sanderistas have rallied behind social-democratic demands that fly in the face of forty years of neoliberal policy, and polls show that millennials are surprisingly receptive to socialist ideas. The positive response to Sanders’s avowed democratic socialism—and to his call for a political revolution—opens the door for a discussion all but absent from today’s labor movement: the importance of socialist ideas to a successful trade union movement. For most of the labor movement’s history, a broad socialist-minded wing fused its vision of society with a practical program for labor’s future. Whether it was the industrial unionism of the early 1900s, the CIO unions of the 1930s, or the rank-and-file anti-concession movement of the 1970s and 1980s, labor’s left offered an alternative to union decline and stagnation. Today, however, labor unions rarely discuss class issues. Disputes are particularized, transformed into individual battles between an employer and its workers rather than a larger struggle between opposing classes. Typically, only bitter and prolonged strikes expose workers to the class bias of the corporate media, the National Labor Relations Board (NLRB), and the courts. With industrial action at historic lows, class consciousness has been blocked from spreading throughout labor as a whole. What’s been remarkable about Sanders has been his ability to use a presidential campaign to bring class front and center. Like Occupy’s targeting of the 1 percent, his campaign has spotlighted and lambasted those who are the true enemies of working people. This should come naturally to labor leaders—but it rarely does. They talk about greedy corporations and repeat mainstream politicians’ tired rhetoric rather than call for more radical change. Many do anything they can to avoid confrontation, from replacing the term “working class” with “middle class” to embracing labor-management cooperation schemes. In the past, strong left-wing currents in labor called out those seeking accommodation with our enemies. But today these lines have become blurred. Sanders has shown how to sharpen them once again. He decries the fact that the top one-tenth of 1 percent own more wealth than the bottom 90 percent. He highlights the collusion between the media, financial interests, and elected officials. In short, he talks about the country’s class structure and calls out its ruling elite. Labor can learn a lot from Bernie. We must fundamentally reevaluate our relationship to capital; adopt an explicitly class-based stance both in relation to employers and within our own ranks; and develop a more sophisticated analysis of government officials and agencies that create and enforce labor policy. This critique is low-hanging fruit, or at least it should be: of course labor should keep its distance from management. Of course strategy should be devised based on the knowledge that the interests of workers are opposed to the interests of corporations. But when labor leaders consistently accommodate themselves to capital, these seemingly self-evident truths bear repeating. Socialist ideas did not just magically disappear from the labor movement. They were purged from unions. At the beginning of the fifties, eleven major CIO unions were left-led. But the anticommunist provisions of the Taft-Hartley Act drove out some of the best organizers and their socialist politics. With the left leadership decimated, the US labor movement developed an ideological affiliation with mainstream Democrats that continues today. By the 1960s, the liberal establishment had fully incorporated labor, and theorists were positing a tripartite pluralist society where labor, capital, and government officials jointly set policy. Many believed that this era of relatively stable labor-management relations represented the end of class struggle. Capital, however, is a restless and relentless force. Even during the height of the US labor movement’s power, when unions were able to negotiate robust collective bargaining agreements, the owners of industry amassed greater and greater wealth. And soon after the economic crisis hit in the 1970s, they launched a counteroffensive—sponsoring anti-labor legislation and pushing for greater employer flexibility and worker insecurity. A socialist current briefly resurfaced during the rank-and-file rebellion of the 1970s as New Left and black liberation movement activists entered labor’s grassroots. But socialist ideas never regained widespread adherence in the labor movement. The following decade, many of these left or ex-left labor activists assumed leadership positions. But they checked their politics at the door so they could bring their organizing skills to a moribund AFL-CIO that was still severely anticommunist. Since then, however, Americans’ views of socialism have shifted. It is long past time to reintegrate radical ideas into the labor movement. Lacking such an analysis, many union officials continue to fail to recognize capital’s ability to reshape society in its own image. When billionaires like Bill Gates use their concentrated wealth to privatize public education or the Koch brothers spend millions attacking unions, they are engaging in class warfare. With labor’s enemies building ever-increasing fortunes—fortunes they can and will use against working people—returning to stable labor-management relations is an illusion. Class-struggle unionism is necessary for the very survival of our movement. Reestablishing effective trade unionism requires a number of concrete actions. We must develop forms of solidarity that move beyond just fighting a single employer and instead confront capital as a class. We must constrain capital’s mobility and cultivate solidarity across borders. We must disregard the “property rights” of employers and be willing to flout labor law itself. We must resist the constant pressure to collaborate rather than fight. Fundamentally, we must put workers and struggle back at the center of trade unionism. None of this is possible in a labor movement that spurns socialist ideas. Here is the basic problem: over the last eighty years, an aggressive capitalist order has reshaped trade unionism. Collective bargaining is now confined to individual corporations, so the union is captive to each employer’s business decisions. The profits extracted from workplaces flow largely to capitalists, and workers have no say over the distribution of the wealth they create. While a web of rules created by the NLRB and the courts have granted this status quo legal legitimacy, today’s labor policies are merely capital’s worldview imposed on the labor movement. Without a socialist analysis, economic shifts look like forces of nature rather than human creations. Issues like capital flight, subcontracting, or corporate globalization are taken as givens, impossible for any labor movement to resist. A socialist trade unionism, on the other hand, would demand that capital be bent to labor’s needs. Past moments in the labor movement—like the AFL’s closed-shop era, when unions controlled hiring decisions and worker education, or the CIO’s solidarity unionism, which brought hundreds of enterprises under the same master agreements and used industry-wide strikes to halt production—remind us that this is possible. And so has Sanders’s run. In a refreshing challenge to the neoliberal views of Hillary Clinton (and much of the labor establishment that backs her), Sanders has promised to direct societal resources away from the banks to rebuild inner cities, create jobs, and provide free college education. Applying his vision to trade unionism means rejecting the idea that capital has an inherent right to do what it wishes to our jobs and our communities. "The treatment of labor as a commodity subject to the rules of the marketplace is a defining feature of capitalism. The claim of a constitutional right to strike—a right to interdict the free competition of individuals in the buying and selling of labor power—obviously imperiled the ideology and practice of commodity labor. The right to strike could not be justified without addressing the question of labor liberty per se." Bringing the labor movement back to life will involve borrowing strike tactics from the 1930s—like mass picketing and workplace solidarity — that are illegal under the existing order. To engage in such tactics, the labor movement must recognize that the government and the NLRB are not ineffective protectors of labor, but rather part of the political establishment Sanders rails against. The success of the Sanders campaign—despite the efforts of the corporate elite, establishment politicians, and the mainstream media—demonstrates that this kind of left-wing, anti-establishment unionism can find a base of support within the contemporary working class. Reintroducing class struggle into trade unionism also necessitates having a serious discussion about the state of labor’s reform-minded wing. Supportive of diffuse activism, this broad coalition includes true reformers and those who, in the past, would have been considered collaborationist hacks. Many in labor embrace what could be called “labor pragmatism”—initiatives that try to fight smart within the existing system, like the inside strategy, the corporate campaign, and the one-day strike. All of these are sensible strategies for workers forced to struggle within an unjust framework of labor control. But because they do not challenge the underlying paradigm, they cannot revive the labor movement. Many in labor’s progressive wing favor the phrase “social movement unionism” to describe a form of unionism that emphasizes community ties and rejects narrow unionism. This is particularly true in public-sector unions, which live or die based on public support. Social movement unionism is a broad concept that can encompass a wide range of activities, from the class-struggle approach of the Chicago Teachers Union to staff-driven models more akin to business unionism. It’s time to move beyond these concepts and toward a more Sanders-inspired vision of labor organizing, which puts our fight in the context of the struggle between the 1 percent and the rest of the population. Class-struggle unionism incorporates the broad demands of social movement unionism into a workplace-centered struggle against management. Labor’s most recent upsurge was the 1960s wave of illegal public-sector strikes, which pitted public employee unions against union officials, the media, the courts, and pro-corporate politicians from both parties. Labor’s next upsurge will contend with the same forces and require a similar anti-establishment bent. Without a strong left wing to hold them accountable, national labor leaders are largely given a pass. While they may adopt progressive positions and embrace new forms of organizing, they rarely discuss breaking free from repressive labor laws or engaging in a Sanders-style political revolution against the establishment. Now is the time for labor activists to inject a class-focused perspective into union circles. Millions have responded to Bernie Sanders’s demands to end insider politics, to take on the financial elite that impoverishes American workers, and to create a better future. For a labor movement on life support after decades of business unionism, a similar call represents our best and only hope. Begging for crumbs from a rigged system of labor control is no future—we need a labor revolution. 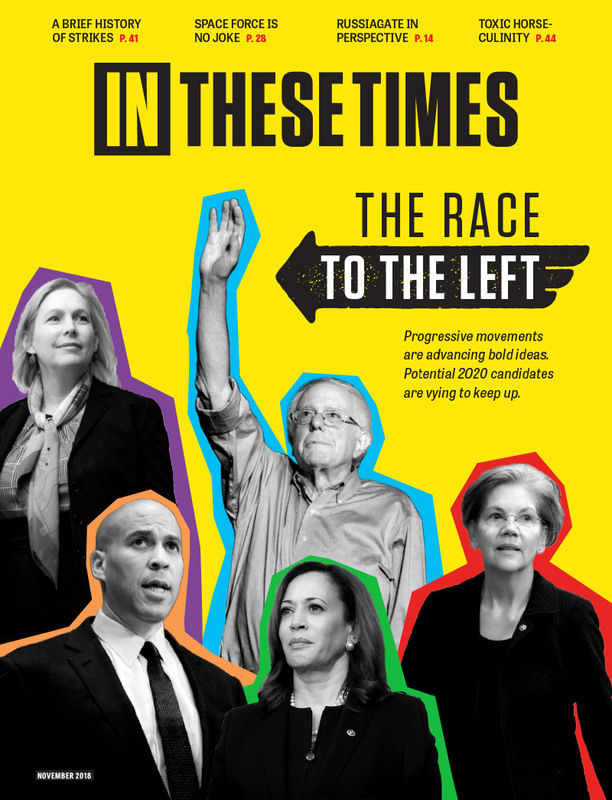 In These Times is proud to feature content from Jacobin, a socialist quarterly magazine. Support Jacobin with a yearly subscription for only $29.95. Joe Burns, a former local union president active in strike solidarity, is a labor negotiator and attorney. He is the author of the book Reviving the Strike: How Working People Can Regain Power and Transform America (IG Publishing, 2011) and can be reached at joe.burns2@gmail.com. It was surprising so many unions endorsed Hillary Clinton since her husband Bill kicked in the teeth of unions with NAFTA. Interesting piece. But it's extraordinary how much an examination and debate on history, ideology and organization is absent from these calls. Quite imprisoned within American parochialism and the boundaries of the officially permissible. Excellent article but what about climate change. It's the greatest challenge humankind has ever faced and labor has a vital role in the solution.